You are defeated once. Die once. But every defeat, every humiliation, every death I have ever seen or imagined is mine. 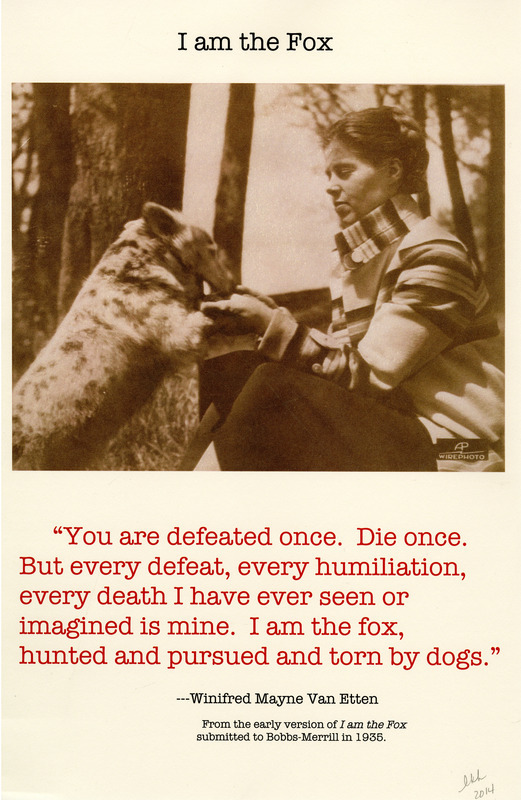 I am the fox, hunted and pursued and torn by dogs. – Winifred Mayne Van Etten, I am the Fox original manuscript, submitted to Bobbs-Merrill in 1935. 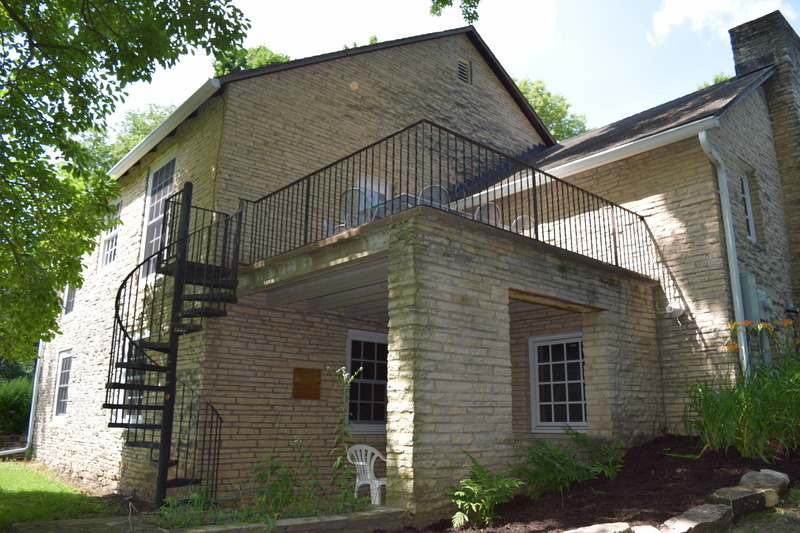 The Van Etten-Lacey House was formally dedicated as the Center for Literary Arts on October 6, 2012, but the connection between 408 South Third Street and Cornell College goes back much further. As early as 1913 this address had been the location of the Watson House, a boarding house for female Cornell Students. One boarder was Winifred Mayne, a young English major who loved the view of the Iowa countryside from the home’s wide living room windows. Mayne would later become an English Instructor at Cornell College, but she left after marrying Bernard Van Etten in 1934 because the College was reluctant to employ a married woman during the Depression. Winifred Mayne Van Etten would be reinstated in 1937, possibly due to the success of her novel I am the Fox. The book, a roman a clef based on Van Etten's experiences at Cornell, won a $10,000 prize from Atlantic Monthly, and a publishing contract. She and her husband used the funds to build a cottage for themselves on the site of her old boarding house. 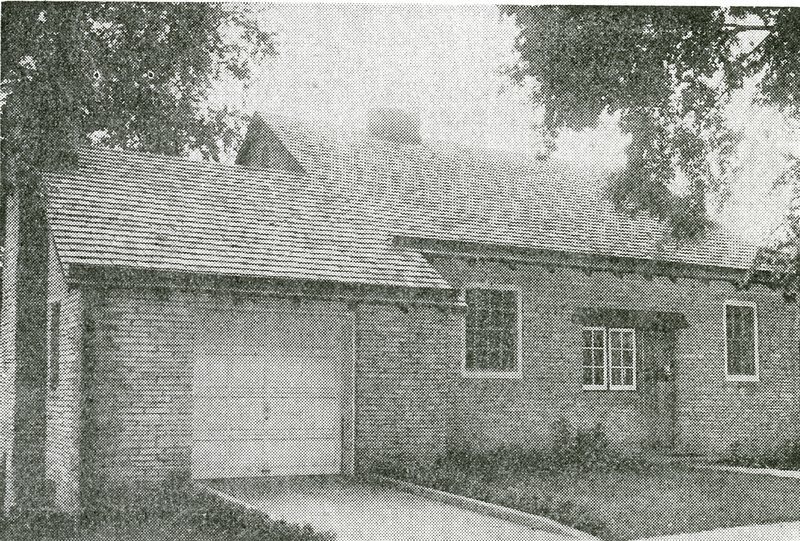 Bernard Van Etten had been an architect prior to becoming superintendent of the Iowa Manufacturing Company, and he built their home himself, even cutting the stone used for the tile floors. Constant additions and tweaks were made over the years; by Ben Van Etten’s own estimation it took 25 years for the house to be fully completed. Nearly every room was paneled with a different type of wood, including walnut, birch, and tropical. The limestone used for the basement floors and the outer walls was brought from a local quarry in Stone City, Iowa, about 20 miles away. 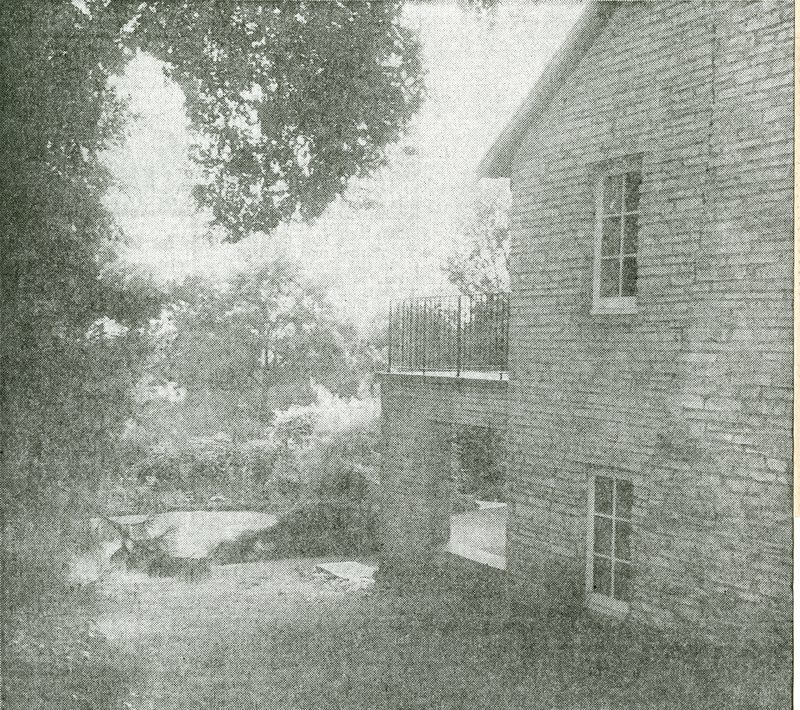 The location of the house along the hilltop allowed for a unique design; although it appeared to be only one story from the street it actually had two stories. One of the myriad rooms located in these lower stories was a workshop equipped with a stone fireplace and a forge for Ben Van Etten to develop designs in wrought iron. The shop was also equipped with built-in bunk beds, allowing the workshop to double as a guest room. The architectural additions were all done in service of creating a welcoming atmosphere. The Van Ettens frequently had overnight guests in the form of friends, visiting celebrities, alumni, and even current students. Ben Van Etten’s elderly father also lived with the couple towards the end of his life, and the view of the Iowa countryside from those wide dining room windows brought him a great deal of comfort. Even during waking hours, the house was often the “scene of student gatherings with exciting literary conversations,” and Professor Van Etten welcomed students to drop by to discuss assigned readings or other classwork. Winifred Van Etten was a noted cook, who often served tea and dinner to her visiting students. Alumni looking back would frequently describe the Van Etten’s House as a “home away from home.” Professor Van Etten retired from teaching in 1968, although she and her husband continued to live in the house and enjoy hosting various events for Cornell faculty and visiting alumni. As early as 1973, the Van Ettens were already discussing what they wished to do with the house after they passed on. Dr. Roberta J. Boetsch ’75, who had been dating the Van Etten’s nephew, recalled hearing Ben talk about how much he wanted to leave the house to the college. Winifred Van Etten died in 1983, and about a year later her husband moved into a nursing home full time, eventually passing away on June 11, 1985. Before his death, Ben Van Etten made explicit his desire to leave the house to the school in an article for the Cedar Rapids Gazette from September 5, 1984. “This is where I spent a lot of my life and I figure the school can use it for holding small classes or meetings.” Cornell wound up selling the house and using the proceeds to establish an endowed scholarship fund in the Van Etten’s name. Soon after, it was acquired by Cornell English Professor Stephen Lacey. Fortunately, Professor Lacey enjoyed carrying on the Van Etten House’s long-standing tradition of hospitality. Professor Lacey was a Cornell College graduate, Class of 1965, and a former student of Professor Van Etten. He would later say that she, along with Elizabeth Isaacs and John Shackford, were the ones “who sent me out into the world well-trained in the history of literature, heightened by their love of their profession, enriched by their skills as readers and as critics.” Lacey returned to Cornell as a teacher in 1977 and would become popular at the college for the effort he put into his courses on Shakespeare and later on AIDs literature. His specialization in AIDS literature led him to found the first LGBT rights group on campus in 1978. Professor Lacey maintained the house’s established tradition as being a place of congregation for students, faculty and alumni alike, particularly those associated with the English department. His death in 2000 was a devastating loss for both Cornell’s faculty and its student body. In 2012, a fund was organized by Cornell friends and alumni to purchase the house, which would be renamed the Van Etten-Lacey House in honor of both its distinguished residents. The House was formally dedicated on October 6, 2012, and dubbed the Center for Literary Arts. Cornell renovated the interior, and at the time of the Center’s dedication the house served as the home for visiting instructor Mark Mayer, Cornell’s first Robert Dana Writer Fellow. Today the dining room with the wide bay windows is used to host classes, mostly offered by the English department, and a recently purchased printing press from the nineteenth century is located in the basement. 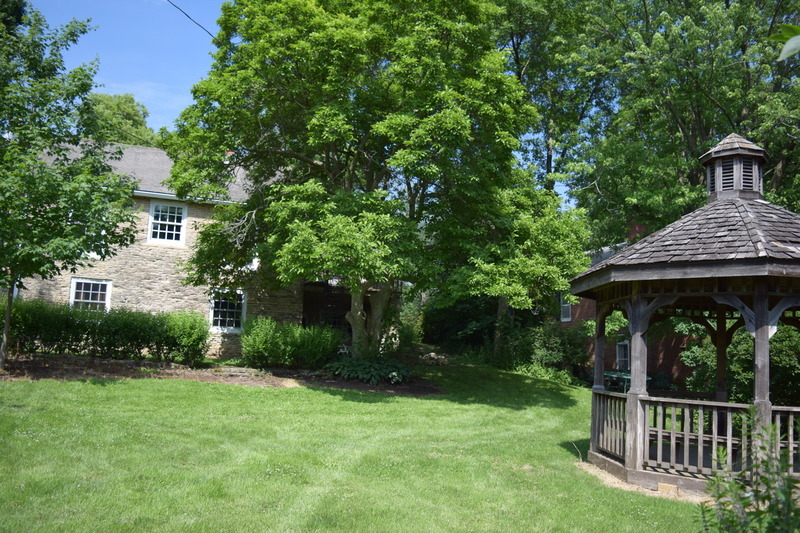 The house is now home to the interests of both Ben and Winifred, as her involvement with The Husk and the printing press in South Hall is echoed in the Foxden Press, established in 2014, and Ben’s wish that the school would use the building for classes has been realized. 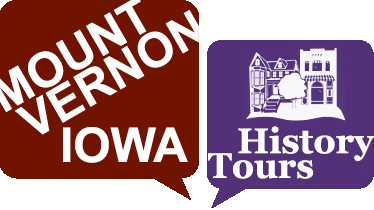 Brad Kane '18 and Hannah Robertson '18, “The Van Etten-Lacey House,” Mount Vernon History Tours, accessed April 23, 2019, http://mtvernonhistorytours.com/items/show/28. “Dedication for the Van Etten-Lacey House and the Opening of the Center for Literary Arts,” Promotional Pamphlet, College Archives. “Mount Vernon Authoress to have a “Story Book” Hillside Cottage,” College Archives. Ibid. Ibid. Naomi Doebel, “Van Etten Built his House in Mt. 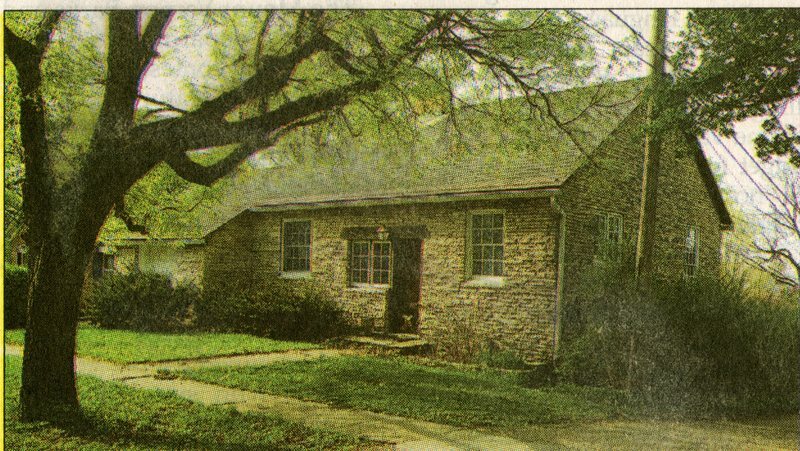 Vernon like a Little Castle of Iowa Limestone,” The Cedar Rapids Gazette, July 29, 1956, College Archives. Bob Denney, “Benny goes for the pin,” The Cedar Rapids Gazette, September 5, 1984, College Archives. 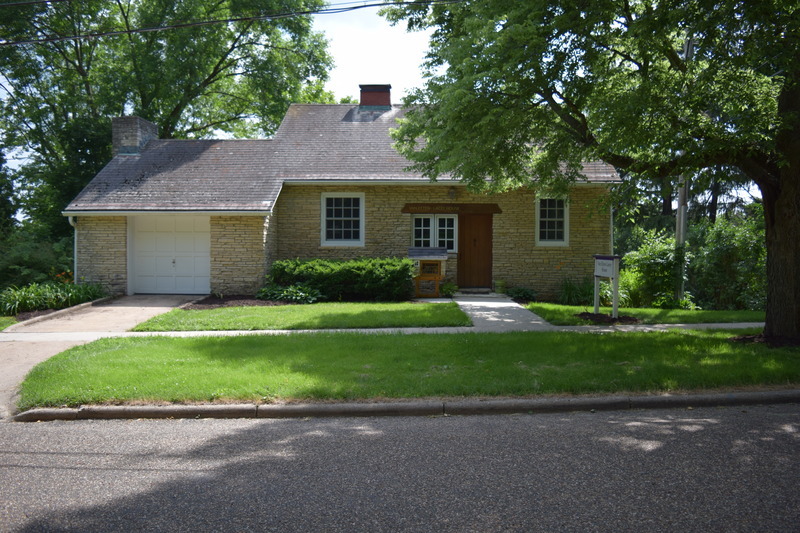 Doebel, “Van Etten Built his House in Mt. Vernon like a Little Castle of Iowa Limestone.”  Ibid. Ibid. Ibid. “The Ben,” Bernard Van Etten Memorial Service, College Archives. 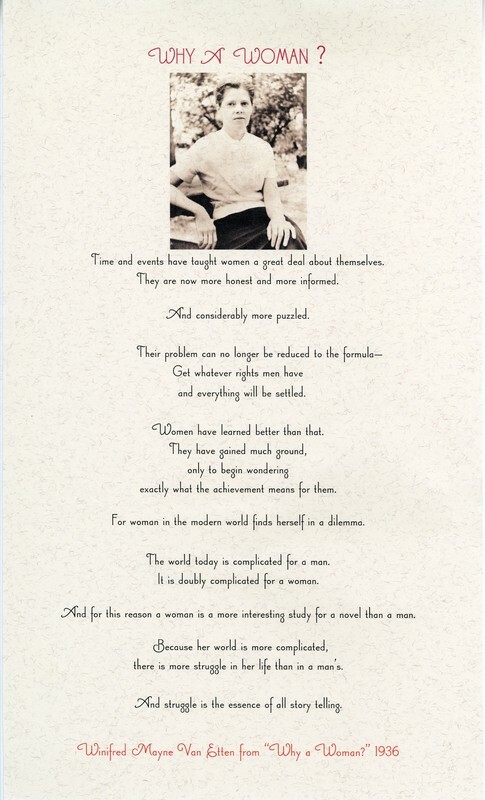 Signi Falk, “Letter to Iowa Commission on the Status of Women," College Archives. Ibid. Robert Majors, Letter to Bernard L. Van Etten, November 3, 1976, College Archives. Roberta J. Boetsch, “Letter to the Editor – Van Etten Lacey House,” The Cornell Report, August 21, 2012, College Archives. Bernard L. Van Etten obituary, Cedar Rapids Gazette, June 14, 1985, College Archives. Denney, “Benny goes for the pin.”  “Dedication for the Van Etten-Lacey House and the Opening of the Center for Literary Arts.”  Ibid. 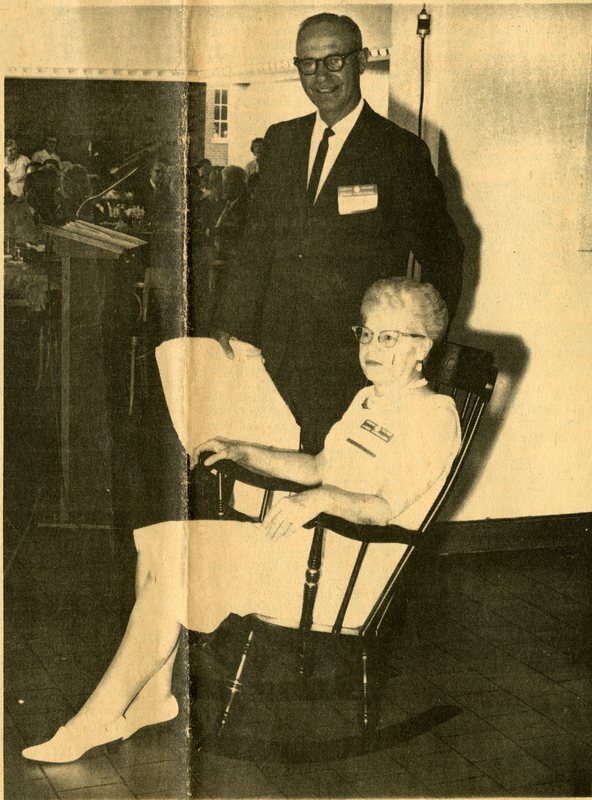 Stephen Lacey, “Speech delivered at Liz Isaacs retirement luncheon,” May 1983, College Archives. Ibid. Steven Cook, “Cornell professor Stephen Lacey dies," The Cedar Rapids Gazette, March 30, 2000, College Archives. “Stephen W. Lacey, 1943-2000 In Memoriam,” College Archives. Ibid. Cook, “Cornell professor Stephen Lacey dies.”  “Dedication for the Van Etten-Lacey House and the Opening of the Center for Literary Arts.”  Ibid. “Van Etten-Lacey House hosts October events,” Mount Vernon-Lisbon Sun, October 4, 2012, College Archives.